Develop clinical skills in both assessment and treatment strategies focused on building client resilience and psychosocial well-being rather than merely to control or decrease symptoms. Mental Health Counselors, Social Workers, and Psychologists who provide counseling and therapy in Behavioral Health, Addictions Treatment, and Community or School Services settings. $425 to register. The discounted "early bird" price, prior to February 1, 2019, is $399. Twenty hours of continuing education contact hours. To integrate strategies and techniques from across a broad range of counseling models into one comprehensive system of treatment. To conceptualizations cases and plan treatment from an alternative, empowering developmental/biopsychosocial paradigm rather than the psychobiological, biomedical DSM-V perspective. Techniques for identifying the social contexts and functional dynamics of client symptomatology. New techniques for identifying ACE’s and Trauma issues which underlie presenting concerns. New techniques for rapidly assessing key cognitions upon which to focus therapy. Strategies for ‘side-stepping’ resistance and the traps and pitfalls encountered in therapy. New strategies for focusing intervention on building resilience & psychosocial wellbeing rather than on symptom control/reduction. Portsmouth is located 90 minutes north of Boston, MA, on the beautiful New Hampshire seacoast. Settled in 1623, Portsmouth claims to be the nation’s third-oldest city. Notable 17th- and 18th-century houses include several within Strawbery Banke Museum, where costumed staff demonstrate traditional crafts. Nearby, the 1855 North Church presides over downtown’s Market Square. Prescott Park has riverside gardens and boat docks. The geographic location, historic past, charming shops and restaurants of Portsmouth regularly land it on various “best places to live” lists. Please make reservations for your stay at the Hilton Garden Inn, Portsmouth, NH. A room block is on hold at a room rate of $129 per night until January 28, 2019.
or call the hotel directly. Boston’s Logan International Airport or Manchester-Boston Regional Airport (Manchester, NH). Limousine service and bus service are available from either airport. C&J Bus service from Boston's Logan Airport to Portsmouth, NH. You will need to take a taxi from the bus terminal to the Hilton Garden Inn Portsmouth Downtown. C&J tickets cost $23 one way. Parking is available at the hotel for an additional fee. Bill and Monica Nicoll bring their combined 75 years of experience in Adlerian Counseling & Therapy including in clinical mental health, marriage & family, school, and correctional settings. 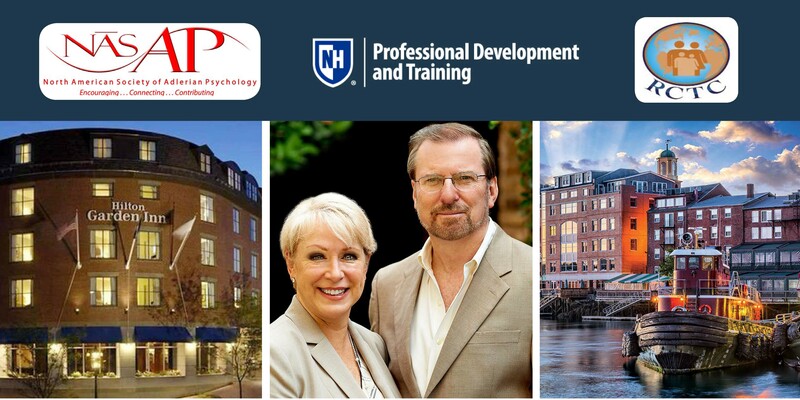 They have served in leadership positions for both the North American Association of Adlerian Psychology and the International Association for Individual Psychology and developed over 500 Adlerian training programs and professional development workshops throughout numerous countries across five continents around the world. They have published in books as well as national & international journals, served on editorial boards for both national and international journals, and served as faculty at several university graduate counseling programs. Dr. Monica Nicoll, LCMHC, received her M.A. degree in Counseling Psychology from the Adler University in Chicago and Ph.D., in Educational Leadership and Research Methodology from Florida Atlantic University. She has been In private practice for over 25 years, Monica has also served as a director of inpatient and outpatient services in child & adolescent treatment centers. She also serves as an adjunct professor and invited trainer on psychotherapeutic practice for universities and professional organizations throughout North America and Europe. Dr. William Nicoll‘s professional background also includes serving as a psychotherapist specializing in Adlerian/Resilience-focused individual, couples, and family therapy with experience in community agency, correctional, and private practice settings. He served for many years as the national trainer in Brief Counseling for the American Counseling Association’s National Professional Development program and has served in a variety of professional leadership positions at the local, state, national, and international levels. Dr. William Nicoll served for over 30 years as a university professor including as Chair of the Department of Counselor Education at Florida Atlantic University. Bill also formerly served on the faculty at the University of Cincinnati and the University of Maine. He has published extensively in professional journals and books on mental health related issues. Bill has trained counselors and therapists in the Adlerian, resilience-based approach to counseling and therapy throughout the USA and across numerous countries on 5 continents worldwide. Introduction to Adlerian Psychology theory and practice including new advances and empirical research supporitng the model. Live demonstration and case study matrial will be used to illustrate the concepts introduced. 8:30 a.m - 6:30 p.m.
AM: Assessment techniques including Lifestyle (cognitive schema) assessement techniques, reframing to developmental/relational perspective. PM: Supervised practice in assessment techniques as well as live case consultation demonstrations with participant case material. AM: Intervention strategies & techniques that build resilience and empower clients to postive growth and change. Live demonstration with volunteer client. PM: Supervised practice in application of these clinical strategies and techniques. Q/A session focusing on participant cases.